OK, I'll preface this with: Flyers fans don't jump off the cliff yet. The Flyers played with more emotion tonight than they have in the last month. Combined. But what we learned tonight was when you play down for so long and you try to flip "the switch," the passion might be there but the chemistry won't be. The biggest reason for the Flyer's woes was poor passing. On the powerplay and even strength the Flyers were not crisp with their passes. Improvement from the last 10 games, but not up to snuff in the playoffs. And that is when they decided to pass. When they started to get frustrated guys like Giroux and Leino and Carter put on their All-Star, big boy pants and tried to stick handle through the Sabres. That just doesn't work against a team set up in the trap, especially a playoff team. Their powerplay was improved, but again, just not up to the level they need to be at. They went 0-5 on the man advantage. At times they looked sharp, and at times it looked like they had no idea what to do. More traffic and more shots need to be the motto on the powerplay. Back to basics if they want to get rid of their goose egg. Ryan Miller played well, but definitely was beatable tonight. The Flyers kept it to the perimeter, and kept the front of the net empty. The Sabres scored the only goal of the game from a rebound in front, when Kaleta pounced on a puck with two Flyers' D standing nearby. And the Flyers' tender, Bobrovsky, played solid and with the butterflies gone should play even better on Saturday. You can't fault him or the D for the loss. The D had one break down, but other than that both the defense and goalie played what was expected of them. So what can the Flyers do to improve next game? Play every period like they played the first. The first period of Game 1 was an in your face, puck to the net, players to the net style that will win them this series. Somewhere in between periods they lost that drive though. Another thing that would most likely help would be to let Nik Zherdev play. For whatever reason, Laviolette decided to dress Carcillo tonight AND not play him against Kaleta's line. Why dress Carcillo and not use him to keep Kaleta from hitting people and setting up in front. But instead Carcillo was played in a subdued 4th line role and really had no impact, which allowed Kaleta to throw big hits and get the game winning goal. Instead, take Carcillo out if Laviolette is not going to use him for the one thing he is decent at, and put in Zherdev. It was clear tonight that the Flyers did not suffer from TOO much offense and they could stand to have Zherdev in the top 9. Zherdev, while a finesse player, generates a lot of shots and allows Giroux and Carter to get in front of the net. Those two things were missing tonight from the Orange and Black. While the Flyers are not out of it, they do need to re-focus and bear down. They need to play post season hockey. And right now they are getting into end of the regular season form. Hopefully the addition of Pronger, who I expect to be in the lineup for a pivotal Game 2, and (please, God) Zherdev will push the Flyers in the right direction. Game 2 is Saturday at 5 pm. zeleCHAT will be open again for the game (had about 6 or 7 people stop in and talk hockey. 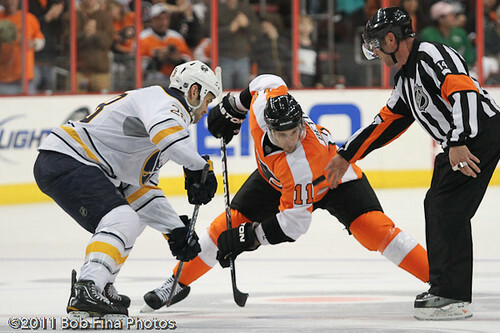 Real fun time) and the Flyers v. Sabres thread in the zeleFORUMS will be updated a lot between now and puck drop.